It’s the battle of the fandoms! Which artist has the BEST fans? It’s in YOUR hands! Click the “Vote” button to vote in each pairing, then click the radio button below your fave to vote for them! Selena. Britney. Taylor. Gaga. Rihanna. Ariana. Bieber. BTS. Beyonce. *NSYNC. Cardi. Nicki. Demi. Backstreet Boys. One Direction. Shawn Mendes. Which fandom will take home the title of BEST fandom? 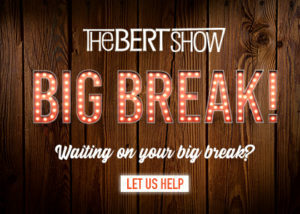 Well, The Bert Show wants to give you your “Big Break!” Find out more.